Hunger: A Memoir of (My) Body – loudlatinlaughing – Euge! Euge! 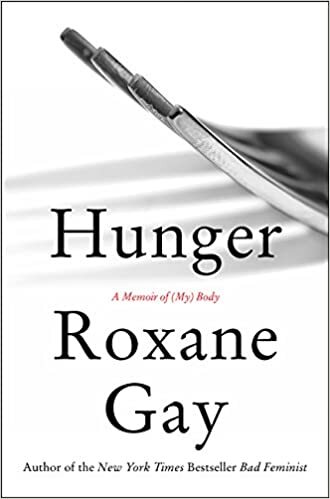 The beautiful Roxane Gay opens herself up about her past and how the horrible thing that happened to her at age 12 led to her fortifying her body with food, eating and eating to form armor that would protect her from the male gaze. The book is heartbreakingly honest, astonishingly well-written, smart, open, searching, and wise. I don’t know how she has handled her escalating visibility in a world that loathes obese people. She’s also an unapologetic feminist, raising her loud intelligent voice to speak truth to power or the crumbling forms of it that coalesce around conservatives. She talks about her weight, brought on almost intentionally by eating her way out of trauma, her parents frantic and not knowing what was going on with her. She discusses her lost year in Arizona where she fled mid-semester at Yale. She details her shyness, hatred of being touched and looked at and talked about, and enumerates several harrowing experiences where invited to talk in front of an audience and afraid the chair was going to break. This book is amazing. Roxane is one of the top writers flexing their pens today and it is a privilege to read her.